Abdrabbuh Mansur Hadi (‘Abdrabbuh Manṣūr Hādī; Arabic: عبدربه منصور هادي‎ Yemeni pronunciation: [ˈʕæbdˈrɑb.bu mænˈsˤuːr ˈhæːdi]; born 1 September 1945) is a Yemeni politician and former Field Marshal of the Yemeni Armed Forces. He has been the President of Yemen since 27 February 2012, and was Vice President from 1994 to 2012. 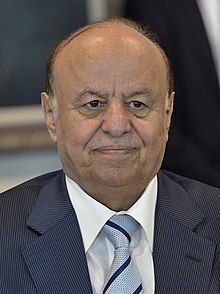 Between 4 June and 23 September 2011, Hadi was the acting President of Yemen while Ali Abdullah Saleh was undergoing medical treatment in Saudi Arabia following an attack on the presidential palace during the 2011 Yemeni uprising. On 23 November, he became Acting President again, after Saleh moved into a non-active role pending the presidential election "in return for immunity from prosecution". Hadi was "expected to form a national unity government and also call for early presidential elections within 90 days" while Saleh continued to serve as President in name only. Mansour Hadi was chosen as a president for a two-year transitional period on February 21, 2012, in an election in which he was the only candidate. His mandate was extended for another year in January 2014. He remained in power after the expiration of his mandate. On 22 January 2015, he was forced to resign by the Houthis after a mass protest against his decision to raise the fuel subsidies and due to dissatisfaction with the outcome of the 2011 Revolution. Subsequently, the Houthis and the supporters of Saleh seized the presidential palace and placed Hadi under house arrest. A month later, he escaped to his hometown of Aden, rescinded his resignation, and denounced the Houthi takeover. The Houthis named a Revolutionary Committee to assume the powers of the presidency, as well as the General People's Congress, Hadi's own political party. On 25 March 2015, after the beginning of the Yemeni Civil War, Hadi fled Yemen in a boat as Houthi forces advanced on Aden. He arrived in Riyadh the next day, as Saudi Arabia began a bombing campaign in support of his government. He returned to Aden in September 2015, as Saudi-backed government forces recaptured the city. In late 2017, he was reportedly residing in Riyadh under house arrest. Young Abdrabbuh Mansour Hadi during his service in the army of South Yemen. Hadi was born in 1945 in Thukain, Abyan, a southern Yemeni governorate. He graduated from a military academy in the Federation of South Arabia in 1964. In 1966 he graduated after receiving a military scholarship to study in Britain, but was not able to attend, as he does not speak English. In 1970, he received another military scholarship to study tanks in Egypt for six years. Hadi spent the following four years in the Soviet Union studying military leadership. He occupied several military posts in the army of South Yemen until 1986, when he fled to North Yemen with Ali Nasser Mohammed, president of South Yemen, after Ali Nasser's faction of the ruling Yemeni Socialist Party lost the 1986 civil war. Hadi played a low-profile role during the Aden Emergency. Following the independence of South Yemen, he rose to prominence in the new military, reaching the rank of Major General. He remained loyal to President Ali Nasser Mohammed during the South Yemen Civil War, and followed him into exile in neighboring North Yemen. During the 1994 civil war in Yemen, Hadi sided with the Yemeni government of President Ali Abdullah Saleh and was appointed as Minister of Defense. In this role he led the military campaign against the Democratic Republic of Yemen. Following the war he was promoted to Vice President on 3 October 1994, replacing Ali Salim Al-Beidh, who had resigned and fought against the government during the civil war. Hadi was the sole candidate in the presidential election that was held on 21 February 2012. His candidacy was backed by the ruling party, as well as by the parliamentary opposition. The Electoral Commission reported that 65 percent of registered voters in Yemen voted during the election. Hadi won with 100% of the vote and took the oath of office in Yemen's parliament on 25 February 2012. He was formally inaugurated as the president of Yemen on 27 February 2012, when Saleh resigned from the presidency and formally ceded power to Hadi. In March 2013 the National Dialogue Conference was conceived as a core part of the transition process and is intended to bring together Yemen's diverse political and demographic groups to address critical issues. In January 2014, Hadi pushed delegates at the conference to break a deadlock on key issues and bring the talks to an overdue close. When those in attendance finally agreed on a final few points, he launched into an impassioned speech that led to a spike in his popularity. It was agreed that Yemen would shift to a federal model of government in the future, a move which have been proposed and forcefully backed by Hadi. For many Yemenis, particularly in northwestern Yemen, this decentralization was less attractive. This mountainous region is the poorest of Yemen and decentralization would mean that it would receive less money from the central government. Relevant here is that the overwhelming majority of Yemen's population has resided in this area for many years. Indeed, the 'decentralization' of Yemen along the lines proposed by the Saudi-imposed Hadi regime threatened Yemen's long-term economic and political independence; scholar Isa Blumi points out that "To any rational observer, the idea of developing Yemen into six disproportionate regions with enormous autonomy was a blatant effort to benefit foreign interests and subdue the rebellious populations through poverty and administrative obscurity." Indeed, if the Saudi-American decentralization 'road map to peace' is implemented, Yemen's oil wealth would be confined almost entirely to the provinces of Hadhramawt and Saba', Yemen's two least populated provinces. Blumi goes on to point out that "This would make bribing the few thousands of eligible 'residents' with a tiny portion of the oil revenue (no longer flowing to the central state) easy, while creating an enormous windfall for those hoping to steal Yemen's wealth." They also didn't like that the new regional borders would rob them of access to the sea. In a move to unify the Armed Forces of Yemen which suffered from split since the Yemeni Revolution, Hadi began reforming the Military. He issued Presidential decree №104 of December 2012 reorganizing the Military into 5 main branches: Air Force, Army (Ground Force), Navy and Coastal Defence, Border Troops and Strategic Reserve Forces, which includes the Special Operation Command, the Missile Defence Command and the Presidential Protective Forces. The Strategic Reserve Forces replaces the Republican Guard. From his early days at office, Hadi advocated fighting Al-Qaida as an important goal. In a meeting with British Foreign Secretary, William Hague in his first days in office Hadi said "We intend to confront terrorism with full force and whatever the matter we will pursue it to the very last hiding place". The Yemeni military has suffered from sharp divisions since Major General Ali Mohsen Al-Ahmar defected in late March 2011 amid protests demanding the ouster of Hadi's predecessor, Ali Abdullah Saleh. The military protests extended to the Republican Guard based in the south of Sana'a when dozens from the Fourth Brigade closed down southern entrances to the capital city and demanded the firing of the brigade's commander, Mohammad Al-Arar, and his general staff. In an interview in September 2012 to the Washington Post, Hadi warned that his country, still reeling from the popular uprising that ousted Saleh, risks a descent into a civil war "worse than Afghanistan" should an upcoming months-long national dialogue fail to resolve the state's deep political and societal rifts. He also said that Yemen was facing "three undeclared wars" conducted by al Qaeda, pirates in the Gulf of Aden, and Houthi rebels in the north, and that Iran was supporting these adversaries indirectly without giving further details. Houthis, on their side, complained of murder attacks on their delegates to the NDC. In response to the disappearance of the Saudi journalist Jamal Khashoggi after visiting a Saudi consulate in Istanbul, Hadi said that "The cheap political and media targeting of Saudi Arabia will not deter it from continuing its leading role in the Arab and Islamic worlds." Hadi was forced to agree to a power-sharing deal after the fall of Sana'a to the rebel umbrella organization Ansar Allah in September 2014. Also known as the Houthis, these revolutionaries refused to participate in the "unity government", although they continued to occupy key positions and buildings in Sana'a and hold territory throughout northern Yemen. Hadi was further humiliated when the General People's Congress ousted him as its leader and rejected his cabinet choices on 8 November 2014. It is important to note that the Houthis' pretext for entering Sana'a' and deposing Hadi was to reverse an apparent breach of the Hadi government's mandate by unilaterally declaring an extension of its power beyond the two-year intermediary period actually set by the GCC and the United States. They also accused the president of seeking to bypass a power-sharing deal signed when they seized Sanaa in September, and say they are also working to protect state institutions from corrupt civil servants and officers trying to plunder state property. Three days after Hadi's resignation (21 January 2015), the Houthis took over the presidential palace. Hadi and Prime Minister Khaled Bahah tendered their resignations to parliament which reportedly refused to accept them. Then the Yemeni cabinet was dissolved. Hadi and his former ministers remained under virtual house arrest since their resignations. United Nations Secretary-General Ban Ki-moon called for Hadi to be restored as president after the Houthis installed themselves as the interim government in February 2015. According to Houthi-controlled state media, Hadi reaffirmed on 8 February that his resignation was "final" and could not be withdrawn. However, after leaving Sana'a and traveling to his hometown of Aden on 21 February, Hadi gave a speech in which he presented himself as Yemen's president and said the actions taken by the Houthis since 21 September were unconstitutional and invalid. On 26 March 2015 Saudi state TV Al Ekhbariya reported that Hadi arrived at a Riyadh airbase and was met by Saudi Arabia Defense Minister Mohammad bin Salman Al Saud as Saudi Arabia and its allies launched airstrikes in Yemen against the Houthis in the 2015 military intervention in Yemen. His route from Aden to Riyadh was not immediately known. On 25 March 2017 a court in the Houthi-controlled Sana'a sentenced Hadi and six other government officials to death in absentia for "high treason", which meant "incitement and assistance" to Saudi Arabia and its allies." The sentence was announced by the Houthi-controlled Saba News Agency. ^ "الصراع السني الشيعي يمتد الى صنعاء". Al-Quds Al-Arabi (in Arabic). 22 July 2013. ^ Profile, bbc.co.uk; accessed 6 April 2015. ^ "Al-Hadi President of Yemen". Al Jazeera. 4 June 2011. ^ "Yemeni President Saleh signs deal on ceding power". BBC News. 23 November 2011. ^ "Yemeni president's term extended, Shi'ite Muslim leader killed". 21 January 2014 – via Reuters. ^ "Saba Net - Yemen news agency". www.sabanews.net. ^ Al-Moshki, Ali Ibrahim (25 February 2015). "PRESIDENT OR FUGITIVE? HOUTHIS REJECT HADI'S LETTER TO PARLIAMENT". Yemen Times. Retrieved 26 February 2015. ^ "Yemen's president flees country by sea amid rebel advance". Fox News. 25 March 2015. Retrieved 25 March 2015. ^ "Saudi Arabia: Yemen's President Hadi Arrives In Saudi Capital Riyadh". The Huffington Post. 26 March 2015. Retrieved 26 March 2015. ^ "Yemen profile: timeline". BBC World News. 24 September 2015. Retrieved 4 October 2015. ^ "Yemeni President Hadi 'under house arrest' in Riyadh". Al-Jazeera. 7 November 2017. Retrieved 30 January 2018. ^ a b "Abdrabbuh Mansur Hadi biography". Yemen Fox. 23 February 2012. Retrieved 14 April 2013. ^ a b c "Saleh's successor: low-profile warrior of consensus in Yemen". Al Arabiya. Sanaa. AFP. 19 February 2012. Retrieved 14 April 2013. ^ ""Hadi elected as Yemen new president", 25 February 2012". Yemen24news.blogspot.com. Retrieved 7 April 2015. ^ "Yemen profile - President: Abdrabbuh Mansour Hadi". BBC News. 26 October 2013. Retrieved 7 April 2015. ^ Kasinof, Laura (25 February 2012). "Yemen's New President Sworn Into Office". New York Times. Retrieved 25 February 2012. ^ "AFP: Yemen's Saleh formally steps down after 33 years". Google. 27 February 2012. Retrieved 14 April 2013. ^ "Yemen's National Dialogue Behind Closed Doors". Atlanticcouncil.org. Retrieved 6 April 2015. ^ Peter Salisbury. "Yemen's quiet president". Aljazeera.com. Retrieved 6 April 2015. ^ a b Blumi, Isa. Destroying Yemen: What Chaos in Arabia Tells Us About the World, p. 196. ^ [Yemeni president orders new structure of armed forces. BBC Monitoring International Reports], 21 December 2012; accessed 6 April 2015. ^ a b Mukhashaf, Mohammed (5 March 2012). "Yemen president vows to pursue Qaeda-linked militants". Reuters.com. Retrieved 6 April 2015. ^ Rothkopf, David (29 September 2012). "Yemen's president warns of a civil war 'worse than Afghanistan'". Blog.foreignpolicy.com. Retrieved 6 April 2015. ^ Saeed, Ali (23 January 2014). "NDC extends Hadi's term for one year on a day marked by an assassination'". www.yementimes.com. Retrieved 9 January 2015. ^ "Middle East leaders back Saudi Arabia after Jamal Khashoggi's disappearance". Middle East Eye. 15 October 2018. ^ "Yemen's Houthis reject new power-sharing government". Reuters. 8 November 2014. Retrieved 9 February 2015. ^ Blumi, Isa. Destroying Yemen: What Chaos in Arabia Tells Us About the World, p. 198. ^ Bayoumy, Yara. "Yemen leader expected to accept demands of Houthis who defeat his..." U.S. Retrieved 14 June 2018. ^ President Hadi's letter to Parliament, yementimes.com; accessed 7 April 2015. ^ "Yemen crisis: President resigns as rebels tighten hold". BBC. 22 January 2015. Retrieved 22 January 2015. ^ Yemen's cabinet is dissolved, cnn.com; accessed 7 April 2015. ^ a b "UN calls for Yemen President Hadi's reinstatement". Gulfnews.com. 8 February 2015. Retrieved 9 February 2015. ^ "Yemen talks to resume as coup is condemned". Al Jazeera. 9 February 2015. Retrieved 9 February 2015. ^ "Hadi affirms his presidential resignation final". Yemen News Agency (SABA). 9 February 2015. Retrieved 9 February 2015. ^ "Yemen's Hadi says Houthis decisions unconstitutional". Al Jazeera. 21 February 2015. Retrieved 21 February 2015. ^ "Yemen's ousted president Hadi calls for Houthis to quit capital". The Star Online. 22 February 2015. Retrieved 21 February 2015. ^ "Yemeni's Abed Rabbo Mansour Hadi arrives in Saudi capital". CBC news. 26 March 2015. Retrieved 26 March 2015. ^ a b "Pro-Houthi court sentences Yemen president to death for treason". Reuters. 25 March 2017. Retrieved 26 March 2017. ^ "Pro-Houthi court sentences exiled Yemeni president Hadi to death for "high treason"". Xinhua. 26 March 2017. Retrieved 26 March 2017.